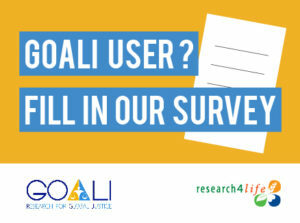 The youngest of the five Research4Life programs, GOALI, was launched on the 6th of March 2018 and will soon celebrate its first anniversary. After one year of operation, we would like to learn more about our users and how we can improve our service. Therefore, we kindly invite you participate in a short survey that will take up about 5 minutes of your time. GOALI – Global Online Access to Legal Information provides free or low-cost online access to legal research and training in the developing world. Read more about the programme.